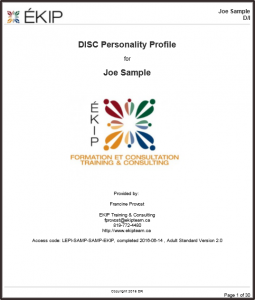 This Standard Adult version of the Discovery Report is a comprehensive personality assessment product. This version is designed to offer extensive feedback. The 30-page computer-generated report is highly accurate and easy-to-understand. The Discovery Report is based on the results of an online personality assessment that will take you only about 15-20 minutes to complete. It is packed full of helpful and practical information to help you to understand yourself and how to adapt to relate better to others. This is not really a test – you can not fail. There are no right or wrong answers, just your individual preferences. This personality report is very useful for business use and personal use. You will learn about your strengths, communication style, decision-making style and gain insights to improve your ability to relate with others.